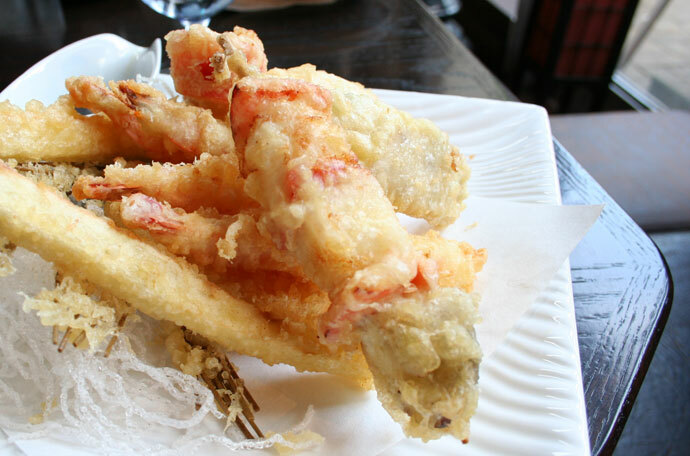 Ebisu on Robson (827 Bute Street, Vancouver, phone 604-689-8266) serves Japanese tapas and Asian-western fusion food, appealing to the younger, hip Asian crowd as well as food enthusiasts seeking a taste above the ordinary. 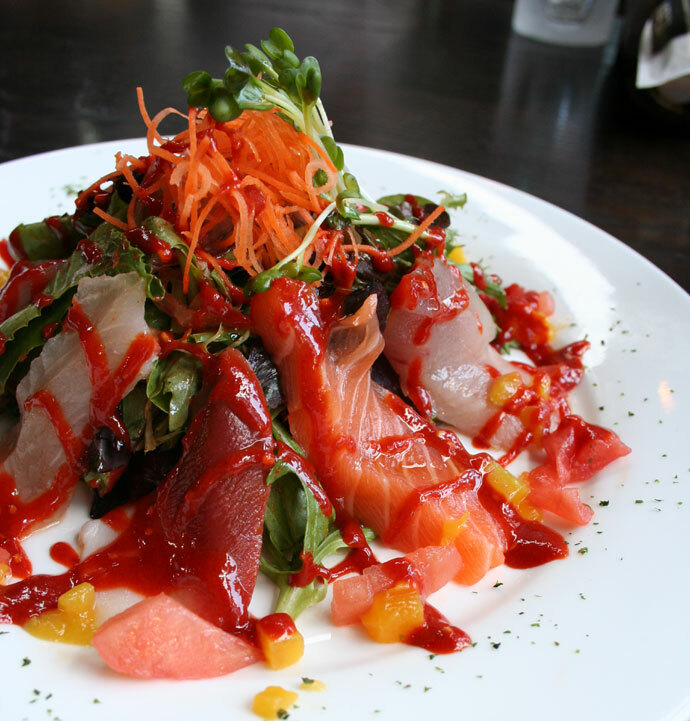 Recently taking over from “Hooters” in this spacious 2nd floor room overlooking Robson street, Ebisu has a varied menu that ranges from delectable sushi concoctions such as the “Crunch ‘n Munch” roll ($12.97, pictured below) to Rack of Lamb and even pumpkin soup and fish tacos. The Oyster Blowout ($12.78, pictured below) has got to be my favorite item. 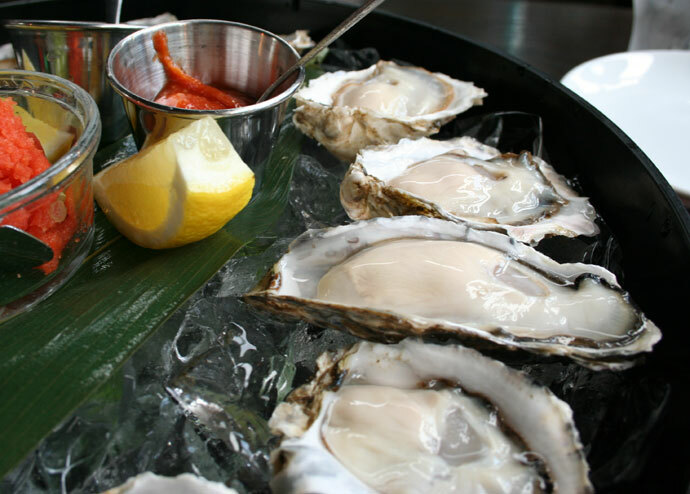 It’s a huge platter of 12 fresh raw oysters served with a variety of sauces and toppings. 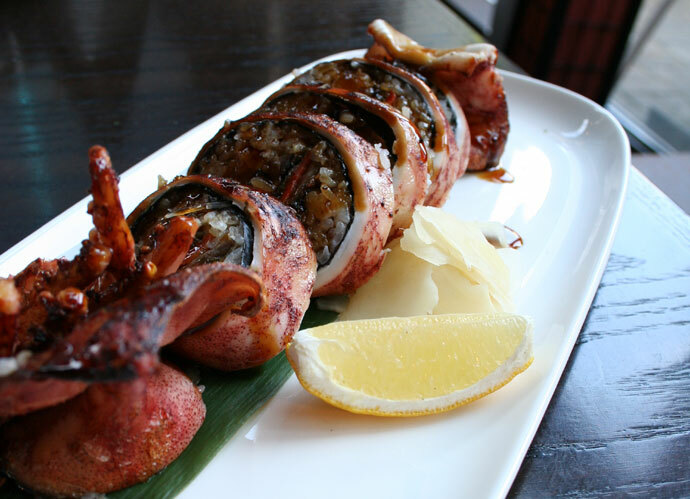 We ordered some more inspired Japanese items, such as the Ika Meshi (stuffed squid rolls, pictured below, $11.11), the Deluxe Tempura ($14.77, pictured below), and the Sashimi Salad ($9.57, pictured below). 22,094 views. This entry was posted on Thursday, July 12th, 2007 at 10:02 pm	and is filed under Asian, Casual, Creative Dishes, Downtown, Favorites, Food Photos, Fusion, Japanese, Raw Oysters, Restaurant, Robson, Sashimi, Seafood, Small Plates, Students, Sushi, Tapas, Vancouver, Vancouver Restaurants. You can follow any responses to this entry through the RSS 2.0 feed. You can leave a response, or trackback from your own site. Your photo work is very nice. The food at this restaurant looks out of this world. Highlighted by excellent lighting and composition. My sweetheart and I were there on Monday, November 24th. We were so rushed as we were headed to the Vancouver/Detroit Hockey game, otherwise we could have sat there all evening. The meal was absolutely fantastic. We both love to try new things and your menu ensured us we would be back for a second seating. I live in Whitehorse, Yukon and he lives in Qualicum Beach, and we both loved everything we ordered. It was hard to leave, I must say. 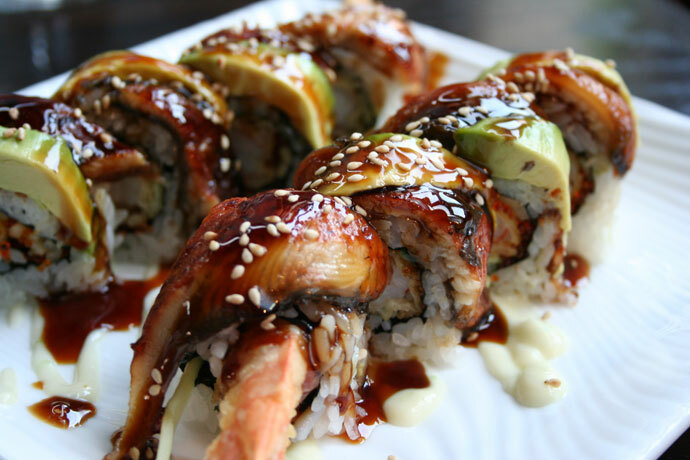 The breaded avacado with the cod roe dip was amazing, and one roll in particular, had unagi on top, I think Samarai something…….O MY GAWD!!!!!!!!! Soooooo Good. The bill was about 120.00 and worth every cent!!!!!! WE WILL BE BACK! I work in a busy pub myself and come in contact with many people headed your way and you can bet I will be nudging them in your direction! Thanks for an unbelievable experience, it will be remembered for a long time!